As some of you may have noticed, over the last couple of weeks, I have been taking advantage of Blogger's new Pages system, which allow me to add static pages to the blog and link them using tabs below the heading banner. If you haven't noticed them, or read my blog using an RSS Reader and therefore haven't seen them, I encourage you to check them out or use them for reference if need be. I have converted the Io Basics posts I wrote a few months into a static page for easier reference, and will use that to present a more extended introduction to Io and my blog. 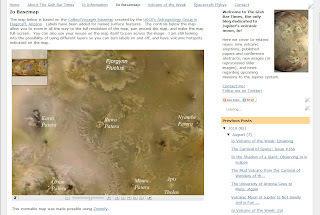 The Io Information page is basically a copy of the three main Wikipedia articles on Io (Io, Exploration of Io, and Volcanism on Io) and provides a more extended introduction to Ionian science than what is provided in the About Gish Bar Times page. I have also added an index of the Io Volcano of the Week articles and an informative table on spacecraft encounters with Io, both past and future. 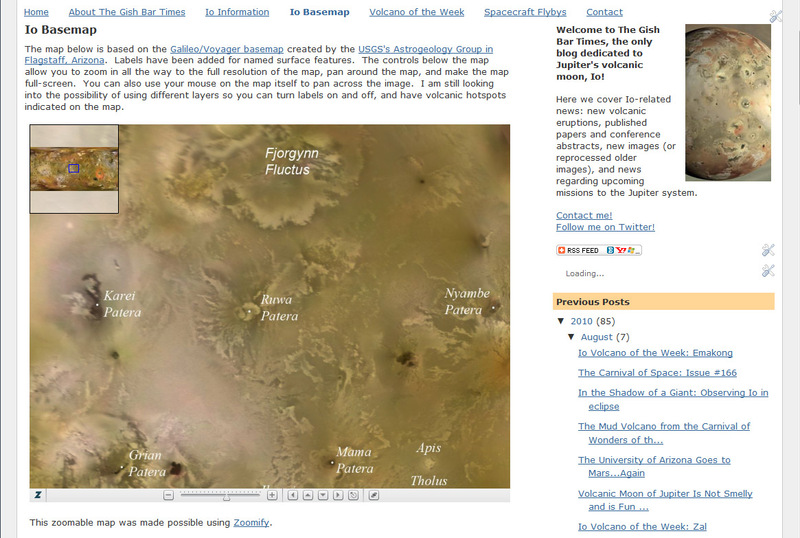 Perhaps the most significant static page I have added is a zoomable global map of Io. The map is based on the USGS global basemap and includes labels for named surface features. The Zoomify map, based on Adobe Flash, allows you to zoom in on the global map as well as pan around using the buttons at the bottom of the player, the navigation inset at top left, or clicking and dragging across the image. You can even expand the image to display full-screen on your computer monitor. In the future I hope to add more functionality to this page, including separate layers for the labels and another indicating the location of plumes and hotspots. Not sure I can do that with Zoomify, so I am open to other suggestions for perhaps using other platforms.